We can't get up for a nice cuppa these days without tripping over some new netbook, but still every now and again one offers styling that catches our eye. Such was the case with Packard Bell's "dot," an Aspire One rebadge with a striking red metallic hinge but otherwise familiar internals. It later appeared as a Gateway in Singapore, and reader APowe emailed to say he'd seen one prowling the aisles at a local Office Depot. We were incredulous, but he drove back to get proof and was kind enough to pass the resulting pics along. 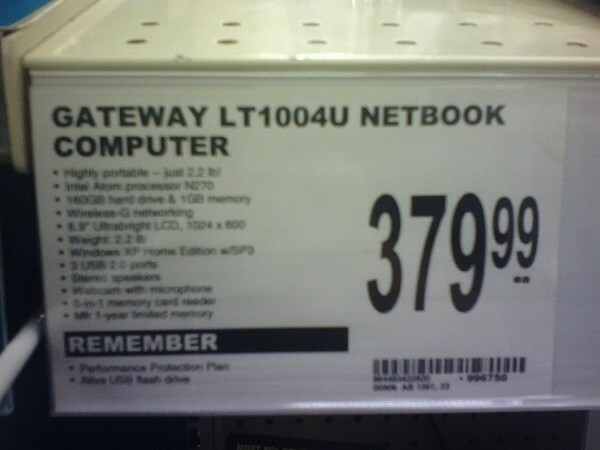 Gateway is calling this the LT1004U domestically; it has the standard netbook specs you've come to love (9-inch screen, Atom 270, 160GB drive, 1GB RAM, Win XP) and is selling for a quite competitive $379. This particular one was spotted in Redmond, WA, but maybe you'll be lucky enough to find one near you.